In a plastic container that has a lid, add the vinegar, vegetable and olive oils, Dijon mustard, garlic, onion, salt, black pepper and sugar. Cover the container with a lid and shake for 10 seconds until the vinaigrette is well emulsified. Alternatively, you can also whisk with a fork in a bowl. Place the lettuce, carrots, cucumber and tomato in a large salad bowl. Pour a generous amount of the vinaigrette on top and toss. The salad should be coated with the vinaigrette but not swimming in it. 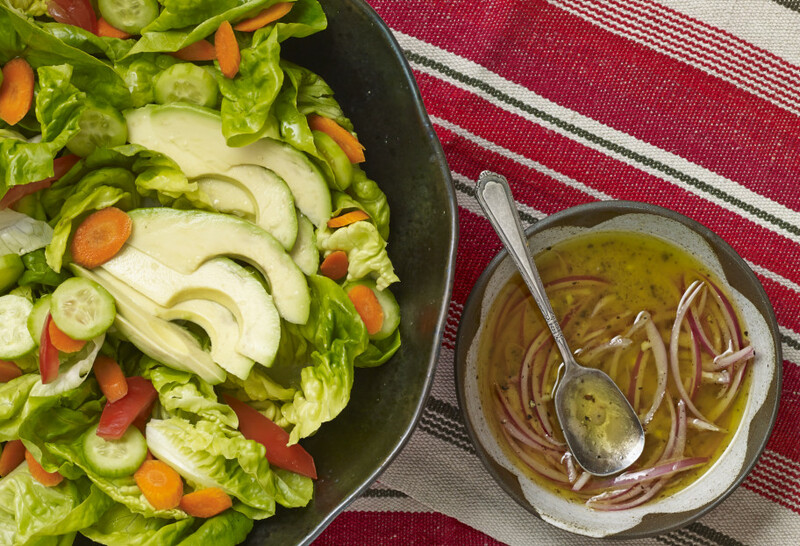 Top with avocado slices, drizzle a bit more vinaigrette on top of and serve. Excellent vinegrette dressing, love, love love it and so easy. My husband can’t enough of it. Thanks, Pati. Also made the beans and salad with shrimp. Divine. I’m onto more of your recipes, for sure. Yay! I hope you love them all, Tina. How long will the vinaigrette keep? It will keep for a few days in the fridge in a sealed container.